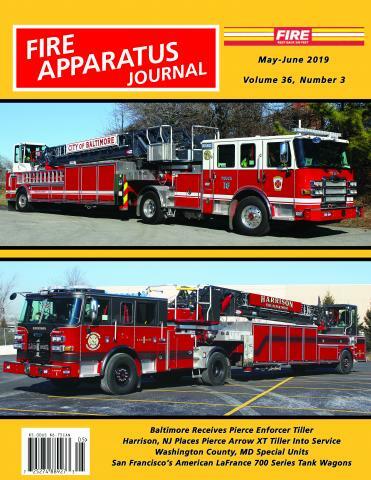 FIRE APPARATUS JOURNAL is published bimonthly. All subscriptions begin with the next issue published. Sorry, we cannot back-start subscriptions. Subscription rates are based on one bulk mailing of each issue. This mailing takes place directly from our printer in Pennsylvania. The mailing occurs during the middle of the month in the month prior to the cover date (example: The January-February issue is mailed during the middle of December). The mailing list is sent to the printer several days before the mailing. Once the mailing list goes to the printer, no changes can be made. Therefore, if you are renewing a current subscription, starting a new subscription, or changing your address, have it to us no later than the second week of the month prior to the cover date or you will miss the deadline for that issue's mailing list and your order will not be effective until the following issue. Once the mailing list is sent to the printer that issue is treated as a back issue. Magazines are mailed Periodical Rate in paper envelopes for protection. We have had too many negative experiences with plastic wrapping. Delivery times vary greatly from area to area and issue to issue. Once an issue enters the Postal System we have no control over delivery times. Some subscribers receive their magazine the day after it enters the Postal System while the vast majority of subscribers in the United States receive their magazines within 10 work days of the mailing. However, we have experienced isolated delivery times of up to 30 days within the United States. For this reason, please do not contact us regarding missing issues until this time period has elapsed. Foreign subscribers must be prepared to endure far greater delivery times. While all magazines (domestic and foreign) enter the Postal System at the same time and location, foreign delivery times are extended, totally unpredictable and beyond our control. Our experience has been that 8 to 12 weeks has become the standard delivery time for foreign delivery. It may take longer. We have exhausted all efforts through the Postal Service to deal with this prolonged delivery time problem. If you live outside the United States and cannot tolerate these excessive delivery times, please do not subscribe. We cannot constantly deal with the numerous complaints regarding this slow delivery. United States subscription rates are $30 for one year, $60 for two years. Please do not subscribe for more than two years as we cannot guarantee rates beyond a two year period. Foreign subscription rates are $40 for one year, $80 for two years. Please do not subscribe for more than two years as we cannot guarantee rates beyond a two year period. It is recommended that foreign subscribers use credit cards for payment. Do not send checks that must be sent for collection. Any checks must be in U.S. Funds written on a check issued by a U.S. bank. International postal money orders are also acceptable but often take considerable time to arrive after purchase.